The 151st running of the Queen's Plate, Canada's premier classic race, will be run this Sunday at Woodbine. One glance at the race's past winners reveals several top Thoroughbreds: the great Northern Dancer; La Lorgnette, Canadian champion and dam of Hawk Wing; recently deceased Canadian Triple Crown winner With Approval; 1998 Breeders' Cup Classic (gr. I) winner Awesome Again (TrueNicks,SRO); and Wando, the last horse to claim Canada's Triple Crown; just to name a few. Also on the list is Flaming Page, winner of the 1962 Queen's Plate. Bred by E.P. Taylor, Flaming Page was Canada's Champion 3-Year-Old Filly and brought high hopes to the breeding shed. Flaming Page proved the most frustrating of breeding stock -- even though she lived to the age of 25, she could produce just three foals in 13 seasons at stud. Fortunately, quality made up for the lack in quantity. Flaming Page's first foal, Fleur (filly by Victoria Park), was stakes-placed and produced English Derby (gr. I) winner, Horse of the Year, and sire The Minstrel (by Northern Dancer). Fleur also produced sires Far North and Pilgrim, full brothers to The Minstrel. Flaming Page next produced Nijinsky (by Northern Dancer), the great English Triple Crown winner and subsequent leading sire and broodmare sire. Her last foal, despite many attempts thereafter, was Minsky (by Northern Dancer), Champion 2-Year-Old Colt in Ireland in the same season that his brother won the English Triple Crown (1970). 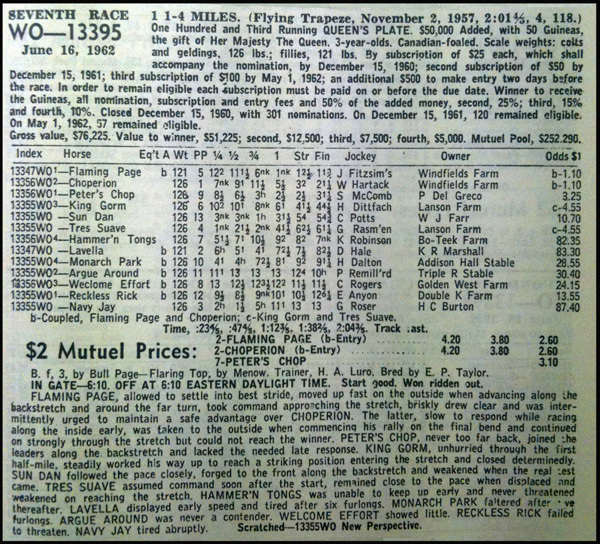 In the Queen's Plate won by Flaming Page (see chart below), her entry-mate who ran second was Choperion (by Chop Chop), a half brother to Northern Dancer's sire Nearctic. Attempts to make Choperion a stallion were thwarted when he almost always refused to cover mares. As a result, he sired just eight foals, including one stakes winner and a stakes-placed horse.